Today we are in flight to one of the most magical places EVER, Cabo San Lucas. Plans have been going down for months for this epic trip to celebrate one of my very best friends in all the world. She is hitting a milestone birthday and I couldn't be more honored, pumped and beaming with glee to be able to celebrate with her in the flesh...adding the word "Mexico" to the mix doesn't hurt either! If you missed any pics from my Instagram reel or don't have an account, I thought I would play catch up over the last few weeks of this month. It's been a fun-filled, busy one. Can you believe the 1st of March is this Sunday? Crazy to think, but welcoming it with open arms....I am over winter and all it's layers. Anybody with me? My youngest, Landry, (a.k.a Sparkle Monkey, LuLu, Texas Tornando, Lu Bear) turned the BIG 7 this month. 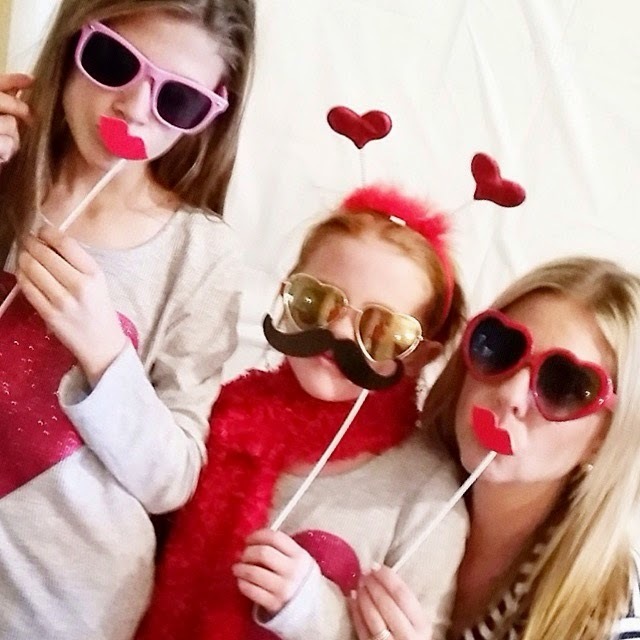 We planned a Valentine's Day themed birthday bash for her and seven of her besties. Photo props were in full effect along with decorating heart shaped cookies, strawberry shortcake popcorn, duct tape flower pens, more crafting and of course more cookies. So, you know how Ross surprised us with Gus over a year ago?? Well, he thought it would be "fun" to throw another one at us by doubling our dog pleasure. 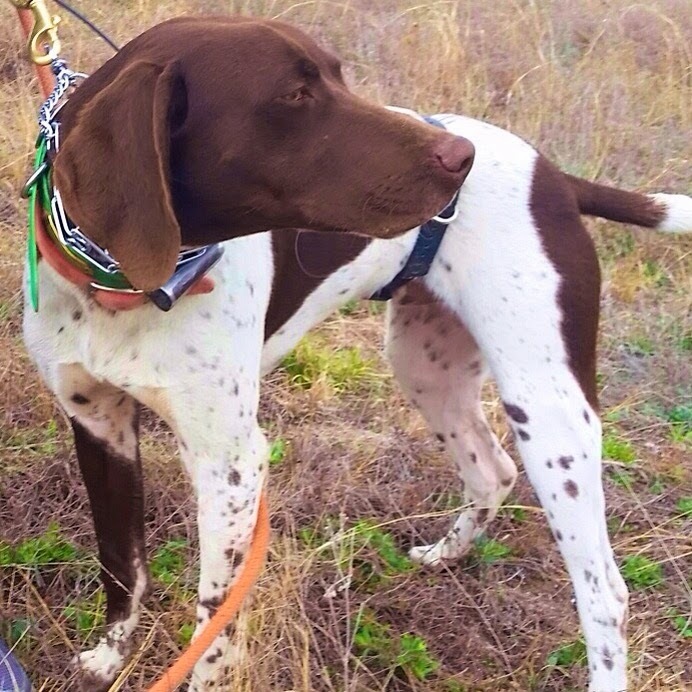 Yep, we will be adding another German Shorthaired Pointer to our family in a few weeks. His name is Bandit Beau and is 7 months old. I am still on the fence about having another dog in our home and not the happiest mom on the cul-de-sac. Knowing Gus will have a brother/sidekick and the kids being thrilled beyond belief makes it more tolerable. I will keep y'all posted. Wish me luck! 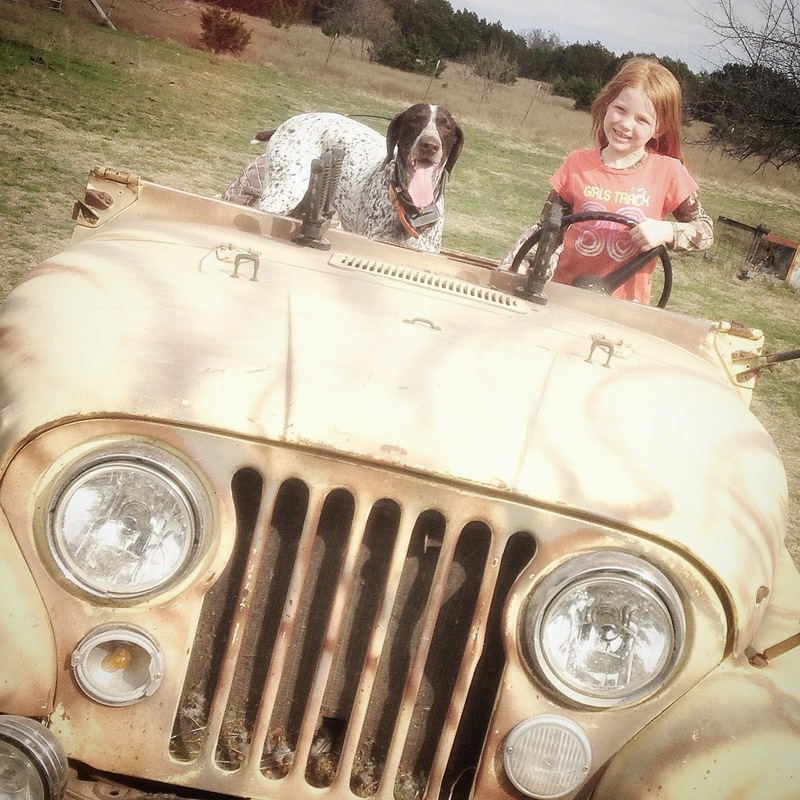 Speaking of Gus, I couldn't help but share this pic of him and Landry out at the deer lease. As much as this picture looks staged....it's far from it. I walked up to these two hooligans playing pretend on their so-called Safari Hunt. And in case you are wondering, this old Jeep still runs like a champ...on back roads. I have said it once and I will say it until the day they lay me to rest....Target is the bees knees. 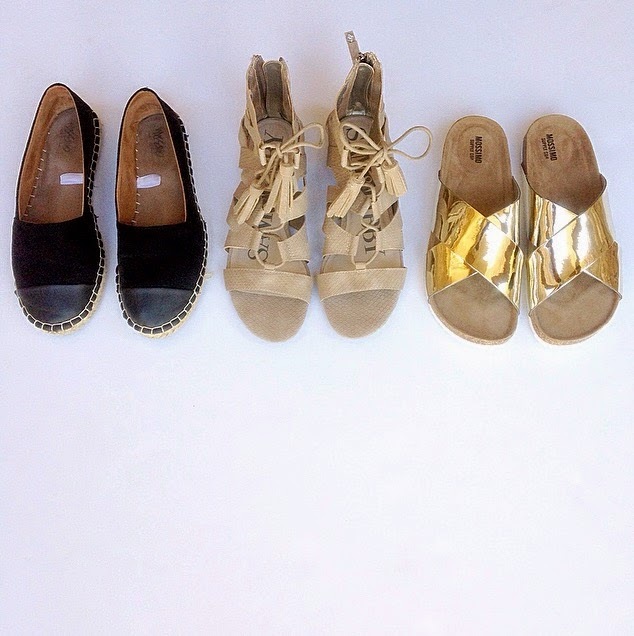 Their spring collection of shoes is off the charts. Call it having a shopping/shoe problem, totally legit statement, but spring and summer are around the corner and I needed a few upgrades...affordable ones. I cannot take the metallic slide-ons off...expect to see lots more of these in the near future. Before the big chill hit town, we were enjoying spring-like weather here in Austin. 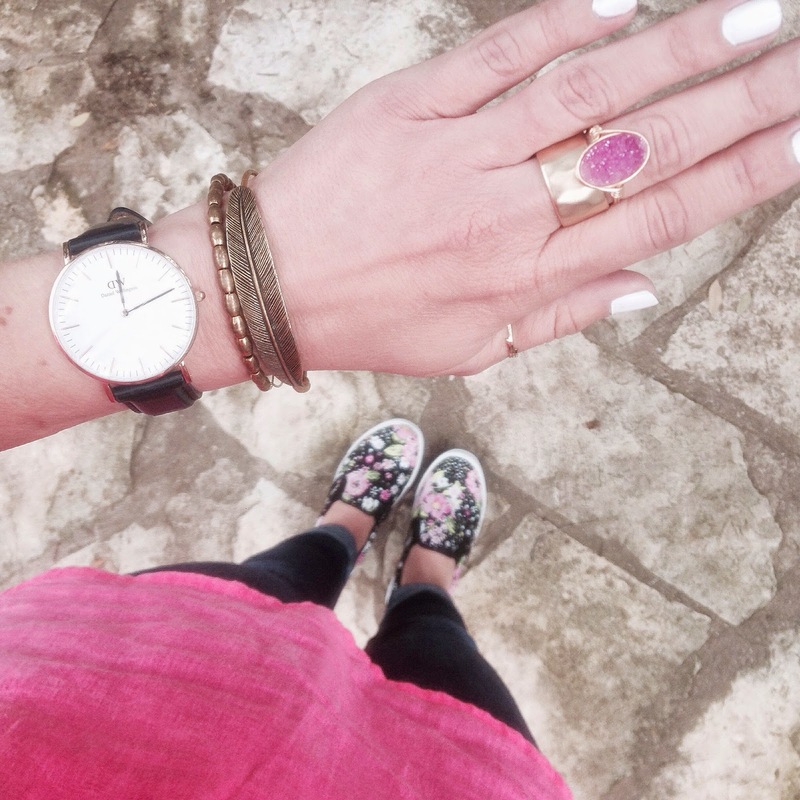 I have been reaching for all things bright and floral...insert printed canvas sneakers and a bold pink top. 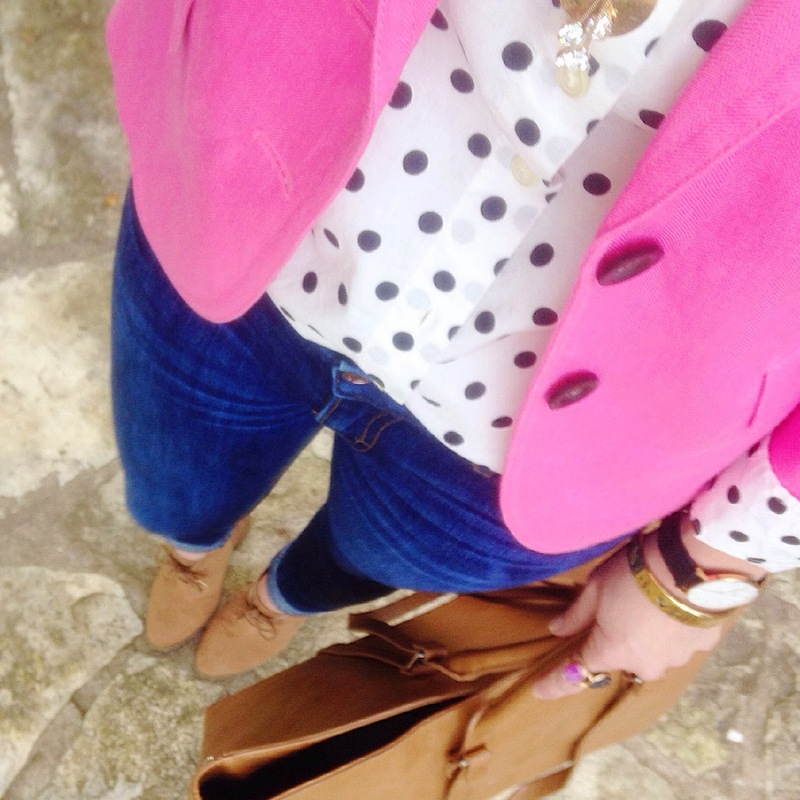 I wore this outfit for a day of running errands and a much need hair appointment. 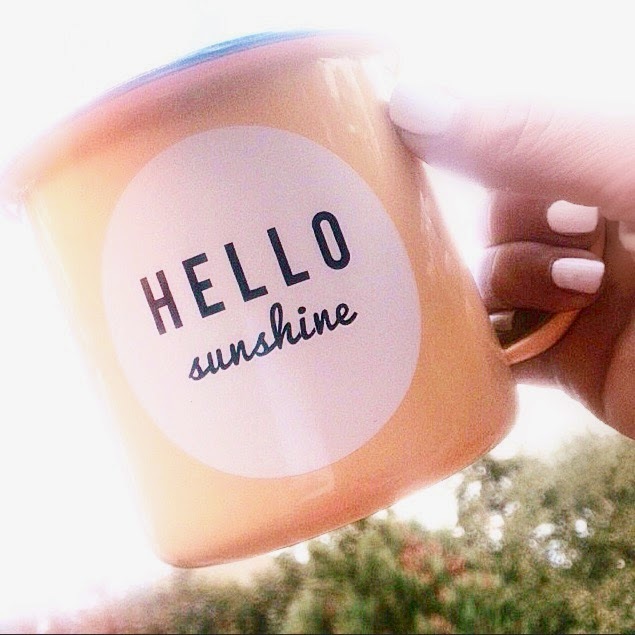 Enough said when it comes to fun mugs and laid back weekend mornings. Old Navy has some super cute graphic print mugs for super affordable prices. They make great gifts for friends or for yourself! :) They are available in store only. Last but surely not least, here is one of the outfits I packed with me for Cabo. I have a thing for pom-poms and tassels....to me they scream summer and warmer days. Plus, this graphic tee is the perfect reminder for us all. See you guys soon and don't forget to follow along during our trip on Instagram, Facebook or Twitter. Cabo Countdown has officially ended...it's time for the real deal!